In the next three years, more than 2.5 million drivers will be using one of General Motors' Ecotec engines, a family of 11 three- or four-cylinder gas engines between 1.0L and 1.5L. Diesel isn't dead, they say, but overseas markets where diesel is king are an increased focus. At GM's powertrain headquarters, engineers told a group of automotive journalists exactly how Ecotec works and where they will be deployed. They'll be built in Flint (thanks to a $200 million investment), China, Hungary, Mexico and South Korea. Twenty-seven GM models will use the engines; the only ones they would disclose would be a 1.0L turbo 3-cyl. in the Opel Adam, and a 1.4L turbo and a 1.5L naturally aspirated engine in the China-only Chevy Cruze. "We see the gas engine coming back," says one engineer during a presentation here. GM believes they are less expensive to build and less expensive for owners to maintain. Three engine families used worldwide — GM hasn't said which ones yet — will be phased out. And although gas is a priority, diesels will be here to stay. The Cruze Diesel in the U.S., for example, is performing better than expected, GM says. All 11 engines are stop-start capable. Europe gets a revised six-speed manual gearbox mating to whichever powerplants they get; no word, again, on what the plan is for the U.S., but expect all compacts currently using both automatic and manuals — Spark, Sonic, Cruze, Verano — to retain both options. Engineers took older engine architectures and trimmed down their weights, starting with making all of the new engine blocks out of lightweight, high-pressure alumninum with iron cylinder liners and an aluminum oil pan. Steel crankshafts are employed for increased combustion in turbo and naturally aspirated engines. Horsepower across the lineup ranges from 75 hp to 165 hp, with torque ranges beginning at 70 lb-ft. to 184 lb-ft. For turbocharged engines, GM says 90% of maximum torque is available at 1,500 rpm; in naturally aspirated engines, peak torque is delivered between 2,200 and 6,000 rpm with help from a two-stage variable intake manifold. One of GM's bigger targets was keeping the engine quiet. 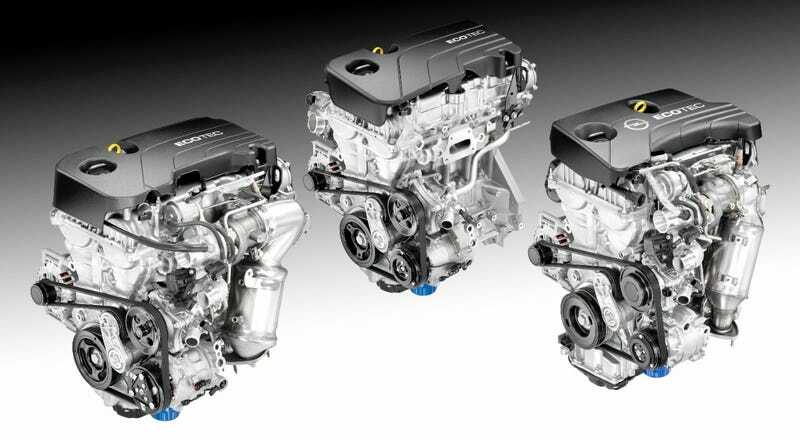 None of us will know until we take them head to head, but engineers say the 1.4L turbo going in the Chinese Cruze (which, since they told us about it, will likely be widely available in America) is half as loud as Volkswagen's EA211 engine in the Jetta and Golf and Ford's new three-cylinder going in the Fiesta. Full production on all 11 engines ratchets up by the end of next year, so no matter where you are in the world, get ready for some comparison testing.